It obviously started with Bridgestone NHL Winter Classic 2008, when Sidney Crosby beat Buffalo's Ryan Miller in a shootout to be an omen of what we were going to see in the playoffs from the Pittsburgh Penguins and eventually an exciting Stanley Cup Final against the eventual champion Detroit Red Wings. The Wings' portion of wows starts as always with Nicklas Lidstrom, Pavel Datsyuk and Henrik Zetterberg and Chris Osgood taking over for Dominik Hasek in the first round of the playoffs and backstopping the Wings to the title. And no recap would be complete without a shoutout about the emergence of Evgeni Malkin as a force when Crosby was out of the lineup for more than a month, plus most of those many highlight-reel goals that Alex Ovechkin scores under pressure to make a difference. Fifty-goal performances by Ovechkin, Atlanta's Ilya Kovalchuk and Calgary's Jarome Iginla and the goaltending heroics of Pittsburgh's Marc-Andre Fleury, New York's Henrik Lundqvist and Dallas' Marty Turco. So far in the first-half of this season, feel-good, wow stories begin with San Jose's thrust in the West behind the direction of new coach Todd McLellan and addition of difference-making defensemen Rob Blake and Dan Boyle (San Jose's 55-15-10 record was best in the NHL for the 2008 calendar year), plus the Chicago Blackhawks' growth into a legitimate Stanley Cup contender behind Jonathan Toews, Pat Kane, Patrick Sharp and Duncan Keith. In the East, the Boston Bruins' coming together and the continued growth of youngsters Phil Kessel, David Krejci, Milan Lucic and Blake Wheeler with the adherence to coach Claude Julien's system of pushing the puck up the ice. 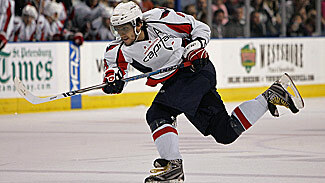 Plus, more of Ovechkin and the Washington Capitals. But who among us will soon forget the year that future Hall of Fame goaltender Marty Brodeur, an iron man through his 15 seasons in the NHL, was lost to the New Jersey Devils long term with an elbow injury just 10 games into the season? And, lo and behold, the Devils continued to win. That's similar to taking Joe Thornton out of the San Jose lineup or Toews from Chicago or Marc Savard from Boston or Ovechkin from the Washington for a long period of time. That's my favorite team wow ... for now. Entering the New Year, New Jersey was 15-11-1 since Brodeur sustained the injury in a 6-1 victory over Atlanta on Nov. 1. Actually, the true reading on these Devils began 14 days later in the home portion of a home-and-home series against Washington, when career backup Scott Clemmensen played in back-to-back games for the first time. Since then, New Jersey has gone 14-6-1 -- with Clemmensen's 13 wins being the most by any NHL goalie. "It's all about the team. It's all about the team overcoming adversity," Devils General Manager Lou Lamoriello said. Coach Brent Sutter said it was like taking the weight of the world off the shoulders of the team after the Devils won their first game without their future Hall of Fame goalie. Then, when the team began to get confidence playing in front of Clemmensen, success followed. "After we got that first win, I knew we were going to be fine," Sutter recalled. "Honestly, I think Jamie Langenbrunner said it best when he said, 'We've always had a great goaltender, but there have also been a lot of good guys in front of him who were never given enough credit.' "
"The good thing about this is that we will be getting Marty back," Sutter added. "We've come together as a team. I haven't had to remind anyone about accountability. The team has always been the No. 1 thing with this group -- and I couldn't be any prouder of them." The Devils, who have often been ridiculed for a stodgy non-attacking style of play, went into the New Year with a 22-12-3 record -- and they did it with two very productive forward lines. The line of Travis Zajac, Zach Parise and Langenbrunner producing an impressive 36 goals in 36 games. Plus, the line of Dainius Zubrus, Patrik Elias and Brian Gionta provided another 34 goals. And that's a double-WOW story for me. Winging it -- In preparation for the Bridgestone NHL Winter Classic 2009 on New Year's day, Red Wings goaltender Ty Conklin made 36 saves in a 4-0 win over the Blackhawks. Here's a great number for you: It was the most saves in a shutout by a Red Wings goaltender since Nov. 21, 2001, when Manny Legace stopped 38 shots in a 1-0 overtime victory in Columbus. Net gains -- Another "Wow" story continues to be rookie Steve Mason's heroics in goal in Columbus that has pushed Pascal Leclaire to being a backup and sent goalie Fredrik Norrena looking for work in Russia. "He's there, the shooter's there, there's nothing to shoot at and he makes the save. Simple as that," Blue Jackets Coach Ken Hitchcock explained. Following a 2-0 win over Anaheim Dec. 31, his third-straight shutout (the only other rookie to record shutouts in three consecutive starts during the NHL's modern era was Glenn Hall with the Blackhawks in December 1955) and fifth in his last 15 games, everyone was talking about how Mason's patience and poise under pressure are beyond his young years. Just like he played in leading Canada to a gold medal in the World Junior Tournament in January. There has been a "wow" or three on those dazzling spin moves by Chicago Blackhawks defenseman Brian Campbell this season. 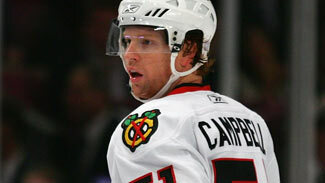 Campbell said he could see a developing success in Chicago after he left the San Jose Sharks and signed an eight-year, $56.8 million free-agent contract in July. But even he didn't see a franchise-record nine-game winning streak that ended in the first of a home-and-home series against Detroit leading into the Winter Classic. "It's even more success than I envisioned," Campbell said. "I thought we could win and make the playoffs based on the excitement I saw out of Chicago last season. But it's really been a lot of fun being around these young guys." Chicago's 20-6-7 record after they won their ninth-consecutive game marked the fastest the Blackhawks had reached 20 win since the 1990-91 season when they did it in 31 games. Campbell's 26 points lead an active and productive defense that transitions to the offense with force. Said Michael Peca, who played with Dominik Hasek in Buffalo in his prime: "He's the real deal." Curiously, in an era dominated by goaltenders, there have been only two goalies to be named Rookie of the Year since Marty Brodeur did it in 1994 -- the Sharks' Evgeni Nabokov in 2001 and the Bruins' Andrew Raycroft in 2004. 250 and counting -- When Sidney Crosby contributed one assist in Pittsburgh's loss to Boston Dec. 30, that meant that Sid the Kid posted the sixth-highest point total through 250 games. The top six are Wayne Gretzky (537 points), Mario Lemieux (423), Peter Stastny (403), Eric Lindros (360), Mike Bossy (345) and Crosby 344. More Hawky talk -- One player the Blackhawks might like to have back is forward Rene Bourque, who was obtained by the Calgary Flames on July 1 for those infamous "future considerations." On Dec. 27, Bourque scored his first career hat trick in Calgary's 6-3 victory over Ottawa. The outburst gave the 27-year-old eight goals in his last 10 games and 14 for the season, just two short of his rookie season-high of 16 goals in 2005-06. "At first it was a shock to me to be traded, but then I began to look at it like a fresh start for me," said Bourque, who had just 10 goals in 62 games last season. "I'm healthy finally. I always felt I could score in this league -- and now I'm getting more and more confident that I can do even more." Don't mess with Iggy -- Since Mike Cammalleri has been put on a line with Jarome Iginla, the Flames' captain has been a force every game. In a 6-4 win over Edmonton Dec. 31, Iginla contributed 2 goals and 3 assists. During his 12 seasons with the Flames, Iginla has had four points on 14 occasions, including twice this season. But he had never reached five points until he had an assist on Cammalleri's empty-net goal in the third period. ... Mark Streit could very well be one of the best offseason free-agent signings of 2008. The Islanders defenseman had a goal and an assist on New Year's Eve to bump his point total to 30 in 38 games. ... Bobby Ryan assisted on the tying goal in the third period and scored the winning goal for the Anaheim Ducks in their 4-3 victory at St. Louis Dec. 28. Ryan has scored 18 points (6 goals, 12 assists) in 19 games since making his season debut on November 16, to lead all NHL rookies in point-scoring during that time. ... Kings GM Dean Lombardi says despite his attempt to acquire Nikolai Khabibulin from Chicago a short time ago he is not currently looking to trade for a goaltender. Interestingly, Los Angeles still has allowed the fewest shots on goal in the NHL, but the team's save percentage has been under .900. Lombardi said his priority right now is to watch the progress of rookie netminder Jonathan Quick, who notched the first shutout of his NHL career on Dec. 23 at Columbus and came back five days later with a whitewash at Phoenix. ... In their first 11 games after Sean Avery was dismissed from the team, the Dallas Stars went 7-3-1. There's no coincidence there. ... Speaking of the Stars, Mike Modano's overtime winner in a 4-3 victory over Anaheim Dec. 27, was his ninth career OT goal -- tying him with Bill Guerin for the all-time lead in that category among U.S.-born players. ... Vancouver reports say talks for a new contract with potential unrestricted free agent defenseman Mathias Ohlund have broken down. With J.P. Barry representing Ohlund, the Sedins and Mats Sundin, and Canucks GM Mike Gillis vowing to keep this team together, don't read too much into those early worries. ... First the Florida Panthers tried switching Nathan Horton from right wing to center. Now, it's Michael Frolik's turn to go from wing into the middle. The first-round pick in 2006, 10th overall, posted 3 goals and 1 assist in his first five games at center. Because of Florida's weakness in the middle, look for coach Peter DeBoer to give the experiment a chance. Frolik skates real well and has shown he's not afraid to physically get involved down low. ... Coming into this season, all we talked about with regard to Edmonton was the emergence of youngsters Andrew Cogliano, Sam Gagner and Robert Nilsson. Now that veteran power forward Erik Cole seems to have found his legs in Edmonton, maybe all a youngster like Gagner needed was a veteran force on his line like Cole to show some life. After Cole scored 1 goal and 2 assists in the Oilers' 5-2 win over Nashville Dec. 28 in a game in which Gagner added 1 goal and 1 assist, Gagner said, "Erik really skates well. He can back off the D and I'm a guy who likes to slow the game down. It seems like a good combination so far." Fanning the fire --Minnesota’s decision last week to scratch Marian Gaborik for consecutive games after his return from missing months of action with a lower body injury fueled ever-burning trade rumors that they were keeping him healthy to deal the potential unrestricted free agent before the March 4 trade deadline. Said Wild assistant GM Tom Lynn, "Ludicrous." The Maxim-mum -- For a guy who just 4 goals in his first 31 games this season and earns his paycheck for his defensive work, Maxim Lapierre is making the most of his recent scoring chances. His first career hat trick powered Montreal to a 5-2 victory over Florida Dec. 29. One night later, he assisted on the Canadiens only goal in regulation and then beat Tampa Bay goalie Mike Smith for the shootout winner in a 2-1 triumph. Said Canadiens coach Guy Carbonneau, "At the start of the year, he was getting rid of the puck too quickly, he didn't want to make mistakes. Now he's playing with more confidence." ... Andrei Kostitsyn scored all three of Montreal's goals in its 3-2 win at Pittsburgh on Dec. 27. Lapierre's trick marked the first time that the Canadiens have had hat tricks in consecutive games since Feb. 10-12, 1992, when Denis Savard and Stephan Lebeau turned the trick. ... We talk about chemistry and how it works. Look no further than Boston's No. 1 line center by Marc Savard. Linemate Phil Kessel's 23rd goal this season wrapped up the Bruins' 5-2 win in Pittsburgh, and it was no surprise that he scored on an assist from Marc Savard. It was the 14th time this season that Savard has assisted in a goal scored by Kessel, the most assists on a teammate's goals for any player in the league. ... With a goal and an assist in the Avs' 5-1 win over Nashville Dec. 29, John-Michael Liles became the second defenseman in Quebec/Colorado franchise history to have at least one goal and one assist in each of three consecutive games -- matching Jeff Brown, who did it for the Nordiques in November 1988. ... Another D-man's story. Toronto's Pavel Kubina scored 33 seconds into overtime Dec. 30, giving the Maple Leafs a 4-3 win over Atlanta. It was Kubina's fifth overtime goal in the last five seasons, tying him with teammate Tomas Kaberle and Vancouver's Sami Salo for the NHL high over that span among defensemen. ... Curtis Joseph's 29 saves on 32 shots spoke loudly about how, if given the opportunity, might still be able to help the Toronto Maple Leafs. Toronto's 4-3 overtime triumph over Atlanta Dec. 30 represented the first of two consecutive starts Leafs Coach Ron Wilson planned to give to the veteran netminder. The win was Joseph's first this season and 450th in his NHL career. ... Flyers GM Paul Holmgren is doing his best salary cap dance these days. Once Daniel Briere (and his $6.5 million salary) is ready to return from a groin injury that has kept him out for more than a month, the Flyers are going to have to make room once he's ready to return. The belief is the Flyers will try to shed the $2.75-million salary of defenseman Randy Jones. Stay tuned. ... With Joe Sakic and now Paul Stastny out of the lineup, Colorado is getting some prime secondary contributions of late. The Avs had two goals by Cody McLeod and one each by Chris Stewart and Dave Jones in a 5-1 victory over Nashville Dec. 29. ... Dallas center Brad Richards, coming off a five-game point streak in which he had four goals and six assists, said after getting three assists in a 4-2 triumph over New Jersey Dec. 31, that he intends to start shooting more. And that will make him doubly tough to defend. ... Patrick Berglund, the Blues' second first-round pick in the 2006 Entry Draft behind Erik Johnson, has tallied 7 goals and 8 assists in 17 games since returning to the lineup from an injury. That's more than any other St. Louis player since Nov. 29. He also leads the Blues with a plus-13. Injured winger Paul Kariya says Berglund is going to become a star in the NHL. Strong words. ... Eric Staal has definitely shown new life under coach Paul Maurice. He had 9 goals and 5 assists in his first 13 games under Maurice after getting 8 goals and 7 assists in 25 games with Peter Laviolette behind the bench. ... With kids come slumps and the Phoenix Coyotes are feeling those growing pains. Good sign for the Yotes, Peter Mueller scored twice in a two-minute span of the second period of a 3-1 win over Colorado Dec. 31. Until scoring in Phoenix's previous game against Los Angeles, Mueller had gone 21 games without a goal. Now, he's got three goals in two games and is brimming with confidence. Said coach Wayne Gretzky, "He's got too much skill not to get chances and with hands as good as he has, pucks are going to go in the net." Time machine -- We've got a Jean Beliveau reference. When Andrei Kostitsyn scored all three goals for Montreal in a 3-2 win in Pittsburgh Dec. 27, he became the first Canadien to record a hat trick while scoring every goal in a Montreal victory since Nov. 3, 1960, when Beliveau single-handedly outscored Toronto, 3-1. ... We know that Michael Ryder used to be a promising scorer in Montreal. Well, Michael is back now that he's gotten a chance to work with Boston centers David Krejci and Marc Savard. After getting only 5 goals in his first 24 games, Ryder netted 9 goals in 12 games in December -- including a game-winning goals in the Bruins 4-2 win over Carolina on December 27 and a 2-1 triumph at Atlanta one day later. Of his 14 goals, seven have been game winners. Furthermore, it was Ryder's fifth game-winning goal in December, tying the Bruins record for a calendar month. That mark was set by Milt Schmidt in January 1951 and matched by Real Chevrefils in November 1956 and Phil Esposito in February 1972. ... Alex Ovechkin is on pace to register 492 shots this season, which would be the closest to 500 since Phil Esposito got 550 in his 76-goal season 28 years ago. Ovechkin posted the best shot total since Espo last season, when he had 446. ... When defenseman Chris Campoli earned the New York Islanders a point when he tied the game with a goal at 19:58 of the third period, he became only the third Isles player over the last 16 seasons to tie a game with one or two seconds left to play in the third -- joining Michael Peca (Feb. 26, 2002 vs. Boston at 19:58) and Miroslav Satan (Jan. 13, 2007 vs. New Jersey at 19:58). ... Toronto hasn't had luck in trading or signing players who have scored 20 goals upon their arrival in Leafsland. Niklas Hagman, who had 27 goals for Dallas last season, might be the latest exception. The last Leaf newcomer to make it to 20 after being a 20-goal man elsewhere was Darcy Tucker, who finished off a 21-goal season after leaving Tampa Bay late in the 1999-2000 season. ... Dustin Byfuglien, born in Minneapolis, scored 2 goals and assisted on the other Blackhawks goals in a 4-1 win at Xcel Energy Center in St. Paul Dec. 28. Byfuglien is the first Minnesota-born player to record four points in a Wild home game. Four Minnesota natives recorded four or more points in a North Stars home game, including Neal Broten, who did it 11 times. ... And how about father's and son's Part 2 after last week's first NHL goal by Brett Sutter, playing for his dad, Flames GM Darryl Sutter. In this installment, we're talking about Chris Bourque, son of Hall of Fame defenseman Ray Bourque. Chris scored his first NHL goal in Washington's 4-2 victory over Buffalo Dec. 30. His first point came in his ninth NHL game. An unfair measuring stick? At the same age (22 years, 336 days), dad had already amassed 283 points (94 goals, 189 assists) in 297 NHL games. Shooting star -- Slow starter? That's how Flyers goal-scoring sensation Jeff Carter describes himself. But now he's got 27 goals, two more than surging Alex Ovechkin and Buffalo's Thomas Vanek. Much of his success has to do with his willingness and ability to shoot the puck. Said Carter, "When I grew up, my dad always taught me you can't score if you don't shoot, so I try to put it in the net every chance I get."